After the atomic bomb detonation of the top side anything that Milburn backed it up with could only seem like a mushroom cloud billowing up from the crater and eventually dissipating in the evening sky. You’d likely be too rattled by the explosion that had just knocked you over to even notice the aftershocks, but – as always with Milburn – the rippling currents of the impact were pretty powerful in their own right. What exactly separates the mere star performers from the superstars… the legends? Is it merely the handful of immortal songs, like Chicken Shack Boogie, that are sure to stand the test of time and become hallowed records in rock’s history? Well no, not really. A lot of artists have one or even two of those and they aren’t top tier icons, nor do they deserve to be. You certainly need to have a few of those to even be considered for such a perch but it’s not the only requirement by any means. We can get into the other objective factors, the groundbreaking qualities and influence on future sounds, the esteem in which other artists hold these acts in, but in terms of just their recorded output the dividing line between the gods and the mortals comes down mostly to the depth of their material. Here’s a way to pass time on a rainy day – take all of the lasting hits of any artist away and see what they have left and determine if that assemblage of B-sides, throwaways – and in the future album cuts – are worth anything on their own. How far down to you have to go before there’s a significant drop off in quality? With Amos Milburn there’s been hardly any drop off, at least to this point. While not everything he did had the requisite components to be a HIT: the catchy hook, the storming performance that makes you sit up and pay attention the first time you hear it, there’s virtually nothing he put out that isn’t well crafted, well sung and well played, above all else interesting in its own right. That’s the difference which elevates an artist to the highest level of acclaim. Consistency. Amos Milburn was unquestionably rock’s most consistent star of the late 1940’s and into the early 1950’s. He doesn’t have quite the influence of the more dynamic Roy Brown, nor the larger than life persona of the irascible Wynonie Harris, and so he may not seem as important at first glance, yet with them you were never guaranteed of getting a great record each and every time out. They’d have their share of duds sprinkled in even if their overall success rate was higher than most and their peaks were as impressive as anyone ever. But with Milburn you needn’t worry about ever pulling the short straw in the bunch from amongst the released output in rock’s first half decade. Everything he did was good… except when it was great. The most astonishing aspect of this release is the fact It Took A Long, Long Time was the intended A-side, which shows how shockingly clueless Aladdin Records was about the potential of what they put on the B-side. Over the years there’s been no shortage for the utterly lame excuses one can come up with to defend the sometimes incomprehensibly bad track record the companies whose JOB it was to understand their customer’s interest, but all of those explanations are shot full of holes when one simply asks – Do you have EARS? While there was certainly no guarantee that Chicken Shack Boogie would be a runaway hit, nobody can credibly argue that of the two sides the one with the greater potential was It Took A Long, Long Time… the one they wound up choosing as the A-side. It’s amazing that the public EVER gets a quality record to enjoy with these deaf and dumb characters running things. But enough about their feebleminded decisions on which side was deserving of receiving top billing, we’ve already covered the one which became the actual hit so now it’s time to study the one that became little more than an historical afterthought. While I won’t let Aladdin off the hook for their ineptness in choosing sides, I WILL be more than happy to state that It Took A Long Long Time has plenty going for it in its own right. Certainly nowhere near as distinctive or memorable as “Chicken Shack”, so it can’t quite reach the standard required to be called great, but it’s not too far off from that level either. With Milburn though he could churn out these types of songs and performances in his sleep and that lack of ambition, originality, inspiration, call it what you will, actually may be what does keep the song from greatness in a way. 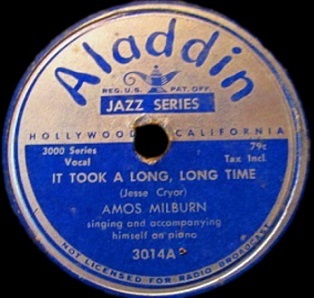 Still, by-the-numbers Amos Milburn is still a heckuva lot better than what most anybody else could deliver on their best day and we see that here right away. It’d be hard not to notice that It Took A Long, Long Time has melodic similarities other songs he’s recorded, notably Pool Playing Blues from back in the spring. With some artists this type of quasi self-plagiarism took on a more onerous tint, as if they didn’t trust their ability to come up with something as good and wanted to milk the cow dry of every last drop, hoping that the relation to the earlier work would give them additional run-off sales. In other cases it could be that an artist didn’t have many original ideas and fell back on what they understood best. I suppose cynically you could make that claim here, for the structure of the song is so well-entrenched in your memory, not just from Pool Playing Blues but also a handful of other sides he cut around this time like Hard Driving Blues and Rocky Road Blues. So that’s reason enough for me to keep this out of the upper reaches of the scores, no matter how well it’s executed, but it’s not reason to dismiss it entirely and use as evidence that he was at risk of turning into a one-trick pony. No, not at all, because context plays an important role in all of this. Artists at the time were constantly working out material in clubs, then coming into a studio only three, maybe four times a year, cutting the best sides and going right back on the road to earn their living. In normal times at least. But as we’ve covered ad nauseum here, the fall of 1947 was not “normal” in any way with the recording ban looming and so artists crammed three or four sessions worth of material into the span of a week or two and naturally they hadn’t had the time to come up with as much as they would’ve if those sessions had been spread over a year or more. So they were more prone to re-crafting a basic approach in a variety of ways in the hopes that the similarities might not be held against them. This was the result of those rather unique circumstances but even so the sides are lyrically diverse enough to show real craft and if the melodic pattern is redundant, well, there’s a reason why the standard 12 bars blues form has stood the test of time. It’s easily recycled. I’m not excusing it entirely, but just making the whys a bit clearer, because the record itself in this case is probably the pinnacle of that entire approach, which makes it somewhat unfortunate that it was so overwhelmed by the flip side, which WAS entirely new and exhilarating. Back in May when looking for a song that might “pull some coin” as the parlance of the day went, they reached for the racier Pool Playing Blues, knowing that its content regarding the smutty euphemisms regarding the female anatomy had a certain base appeal that this, the more sophisticated lyrical job, did not. So they went for what probably seemed like the surer thing and then were surprised when it didn’t quite connect. (Why they didn’t jump on Chicken Shack Boogie at THAT time, which was sitting in the can waiting for a release is beyond me though). It Took A Long Long Time is better than its pool room predecessor and perhaps because he did that sort of thing so captivatingly they might’ve felt another go-round in the fall with a similar styled song might connect this time and so they picked this as the A-side, the one they were placing their bets on to get Milburn his first hit. They made two mistakes however, which in retrospect seem obvious, but truthfully should’ve been plain as day back then as well. The first is that they seemed oblivious to the recent market events that had taken place over the summer and early fall where MOST of the latest noisemakers in the style were culled from the edgier and more exciting brands of rock than this rather mellow, soulful ballad. I suppose they were looking at this like a complimentary song to Ivory Joe Hunter’s Pretty Mama Blues, which was topping the charts around now, but it doesn’t quite stand out in comparison to that, nor does it come close to the vibrant immediacy of the honking tenor sax instrumentals that were as hot as can be as this hit the streets. The other mistake of course is that they DID have just such a song that was both edgy and which certainly stood out in Chicken Shack Boogie, a song that was similar enough in overall style to be connected to the reigning hits of the day yet still different enough in theme and construct to really be noticed. Luckily though they attached this, which had neither of those components, to the one which did. Oh well, I suppose it doesn’t matter which rated higher in Aladdin’s plans, only that the public got to hear them both and settle the matter definitively on their own, something they clearly had no problems doing. But should anyone crawl out of the boisterous chicken shack long enough to flip the record over they would at least be rewarded for their curiosity and potentially be won over by this side’s charms. Milburn’s vocals ooze soul. A kind of languorous, honey-dripping soul that is intoxicating. He sounds in cases like this as if he’s had a few belts himself, but isn’t the kind to let that turn him into a loudmouthed boor. Instead his eyes droop, he gets a smile that sits midway between grin and smirk, yet is just charming enough not to be off-putting. He’s aided in all of this by his usual co-conspirator, Maxwell Davis on sax, who pulls Amos back each time he gets a little spry, a push and pull interplay that never misses its mark. Actually Milburn’s instincts here seem to be a little more sprightly than what Davis lets him get away with. His piano that opens the record is the musical definition of jaunty, almost a playful self-deprecating type of introduction we haven’t heard from him before. He prances across the keys before settling into the more typical supporting role, sharing space with the guitar which injects clean fluid fills in between Davis’s mournful tones on saxophone that keeps it all grounded. This instrumental balance between the three disparate sounds, and disparate moods conjured up by those sounds, is key to making this work. Each time you lean one way something pulls you back another way, almost as if you were standing on the deck of a small boat in rough waters and yet due to their expert handling of the craft you never topple overboard. It’s really an example of how good musicians compliment one another, each doing just what is needed without calling too much attention to themselves in the process. Milburn is perfectly content to roll along with the tide, his voice rising and falling with the waves, leaning hard on the rudder as he comes to the end of each stanza so as to impart a more urgent passage, yet he then pulls back and eases into the next line with cool self-assurance. The storyline is well-drawn too, offering up Milburn as someone who recently freed himself from a bad relationship but rather than speak ill of his ex, recounting the reasons why he left her and criticizing her actions that led him to seek comfort elsewhere, he instead has already turned his focus to the horizon and sings of the liberation he feels and of the eager anticipation to find someone new. Unlike Bye Bye Boogie from last January which had the same theme but was expressed with a far more boisterous outlook, this one projects sort of a contented relief with that predicament, which while not the typical sound of a hit (another reason why Aladdin should’ve known better) it’s refreshing to hear because it’s not a perspective that’s often utilized, adding yet another aspect to Milburn’s ever-growing arsenal of personas he can embody on record. Though he didn’t write this one himself it still takes on all of the hallmarks of an Amos Milburn song. Unlike so many of his contemporaries whose lyrical perspectives often swing wildly from one perspective to another within the same song, as if they were merely free-standing verses stitched together haphazardly and doing nothing to present a coherent narrative, that’s never a concern when it comes Milburn whose plot points follow a very definite and well-sketched out arc. We follow him with confidence because we know that he’s always got a destination firmly in mind. But while all of that is good, very good actually, It Took A Long, Long Time is just that and nothing more – a skilled artist doing something admiringly solid but rather predictable provided you’ve been paying attention to his career to this point. Unlike the flip-side which raised his game to a new level, this offers up something we’ve seen before, tweaked a bit perhaps, but it’s nothing that’s going to change your views considerably on Milburn’s skills, it merely reinforces what we already know. That’s perhaps the unintended curse of consistency… it takes a lot more each time out to really get us enthused. But then again you’d get that jolt after turning this record over for the first time and hearing what was awaiting you on the flip. Here’s hoping that after you were driven wild by that side you went back to give this side another spin because in the end there’s plenty to be said for the reliably solid output from somebody who, unlike the record label, seemed never to take a wrong step in what he was laying down. Leave a reply on "Amos Milburn: “It Took A Long, Long Time”"